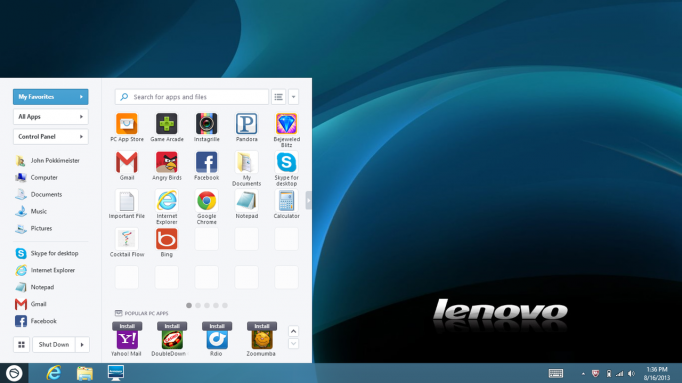 Lenovo first announced last week that they have teamed up with SweetLabs to include an app on Windows 8 called Pokki. While its common for OEMs to add their own bloatware or programs to an operating system, this one is different. Pokki is an app styled program that brings back a pseudo Start Menu. Lenovo is including this to address concerns of Windows users complaining about the lack of Start Menu on Windows 8 (also with upcoming 8.1). So the largest PC shipper in the world is bundling their own start menu. Whether users are right or wrong about the missing menu, it’s clear that OEMs are trying to take matters into their own hands by addressing the 5 quarter-long decline in PC sales. To gain some perspective, Lenovo has shipped more PCs than any other manufacturer over the last 12 months, yet they have sold more tablets and phones than PCs. Microsoft is trying to create a unified interface for all of their devices. This includes Windows Phone 8 (WP8), Windows tables (RT and Pro), and Windows computers. Many will and do appreciate the uniformity. Many things work similar to eachother so you know what to expect. When OEMs start modifying parts of the user interface, it’s actually countering Microsoft’s plans. Is it right or wrong? More people like to complain about the missing start menu while others says they’re weak and it’s time to embrace change. What do you think?